“Why Hast The Mighty Fallen? 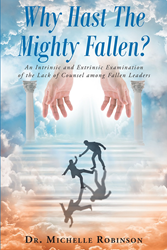 : An Intrinsic and Extrinsic Examination of the Lack of Counsel among Fallen Leaders” from Christian Faith Publishing author Dr. Michelle Robinson is an exploration of fallen leaders, successes of leaders standing tall today, and ways to avoid common pitfalls in leadership. “Why Hast The Mighty Fallen? : An Intrinsic and Extrinsic Examination of the Lack of Counsel among Fallen Leaders”: a detailed book that studies the characteristics of fallen leaders and the causes of their downfall. “Why Hast The Mighty Fallen? : An Intrinsic and Extrinsic Examination of the Lack of Counsel among Fallen Leaders” is the creation of published author, Dr. Michelle Robinson, an official court reporter in Chicago whose passion for helping people has led to a bachelor’s degree in Christian counseling, a master’s degree in biblical studies, a PhD in Christian counseling, and the current pursuit of a master’s degree in clinical mental health counseling. Published by Christian Faith Publishing, Dr. Michelle Robinson’s new book aims to inspire readers to take action by seeking sound counsel, accountability, and self-discipline. View a synopsis of “Why Hast The Mighty Fallen? : An Intrinsic and Extrinsic Examination of the Lack of Counsel among Fallen Leaders” on YouTube. Consumers can purchase “Why Hast The Mighty Fallen? : An Intrinsic and Extrinsic Examination of the Lack of Counsel among Fallen Leaders” at traditional brick & mortar bookstores, or online at Amazon.com, Apple iTunes store, Kobo or Barnes and Noble. For additional information or inquiries about “Why Hast The Mighty Fallen? : An Intrinsic and Extrinsic Examination of the Lack of Counsel among Fallen Leaders”, contact the Christian Faith Publishing media department at 866-554-0919.